If you are working in Java for a couple of years you surely know about Maven, the most popular tool to build Java application. Recently I had shared 10 Maven Plugins Java developer should know and I receive a lot of good feedback about how useful those plugins and Maven, in general, is for Java developers. This motivated me to write more stuff about Apache Maven and then I thought about sharing some of the free ebooks Java developers can use to learn Maven. Sonatype, the company behind Nexus open source repository manager and creators of Apache Maven project provides a couple of good free ebooks to learn Maven and Nexus repository. Unlike other free ebooks which are mostly outdated, these Maven free eBooks are most accurate, up-to-date and can be used as reference material, particularly Maven: The Complete Reference. Since Nexus repository managers are most preferred for in-house Maven repository, it's also important to learn about it. Having Nexus experience and knowledge in your re only going to benefit you. Btw, if you are not looking for a paperback book, you can also check out Maven Essentials, one of the better books to learn Apache Maven. Here is a list of some of the good and free of cost eBooks you can use to learn Apache Maven. They are written by Maven experts and provided by Sonatype, the company behind Nexus, one of the most popular Maven repository manager. Description : Learn by doing — Maven by Example walks you through the key concepts of the world’s leading project management tool. This book is available to download in PDF format as well for online reading. Author : Tim O’Brien, Manfred Moser, John Casey, Brian Fox, Jason Van Zyl, Eric Redmond and Larry Shatzer. Description : The essential reference for anyone working with Apache Maven. Explore the details of the POM, Maven Settings, Maven Archetypes. You can read this book for free online or can download as PDF for offline reading. Description : Learn to organize artifacts, encourage collaboration, and increase efficiency with the industry leading repository manager. This is the go-to guide for gaining full visibility and control in software development with Nexus. It covers both open source version and Nexus Professional. This book is also freely available for download in PDF and online reading. Description : The essential information you need to use Maven within the intuitive Eclipse Interface. Enjoy the comfort and safety of the Eclipse IDE while managing both simple and multi-module Maven projects. This free ebook features: How to Install, Run and Configure m2eclipse, Creating and Importing Maven Projects, Running Maven Builds, Working with Maven Repositories and Projects, Analyzing and Resolving Dependencies, Best Practices and More. This book is available for free to read online and download in PDF format for offline reading. 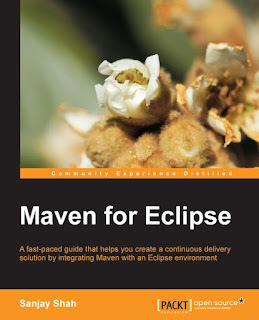 Btw, If you prefer paperback book then you can also refer Maven for Eclipse by Sanjay Shah, one of the good books to learn Maven in Eclipse IDE, but of course, that's not free.